The Medical Letter, Inc. | The Medical Letter, Inc. The Medical Letter, Inc. is a nonprofit organization that publishes critical appraisals of new prescription drugs and comparative reviews of drugs for common diseases in its newsletter, The Medical Letter on Drugs and Therapeutics. 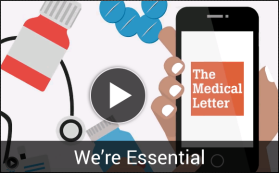 The Medical Letter, Inc. is committed to providing objective, practical, and timely information on drugs and treatments of common diseases to help our readers make the best decisions for their patients—without the influence of the pharmaceutical industry. Many of our readers know that pharmaceutical companies and their representatives often exaggerate the therapeutic effects and understate the adverse effects of their products, but busy practitioners have neither the time nor the resources to check the accuracy of the manufacturers' claims. Our publication is intended specifically to meet the needs of busy healthcare professionals who want unbiased, reliable, and timely drug information. Our editorial process is designed to ensure that the information we provide represents an unbiased consensus of medical experts. If a new prescription drug offers genuine advantages over older drugs, we say so. If a new prescription drug offers no advantage, if its effectiveness is limited, or if it is too toxic or too expensive to justify its use, we say so. If new drug information changes the status of previously reviewed drugs, we publish follow-up reports. The Medical Letter, Inc. was founded in 1958 by Arthur Kallet, the co-founder of Consumers Union, and Dr. Harold Aaron. Kallet was an engineer who co-wrote the book 100,000,000 Guinea Pigs, a best-seller in the 1920s. Some say it played an important part in the Food and Drug Act of 1938, which required for the first time that drugs must be shown to be safe before they can be marketed. Kallet also was a co-founder of Consumer Research, which became Consumers Union, and he started the publication of Consumer Reports. Aaron was an internist who was on the advisory board of Consumers Union. He suggested to Kallet that doctors could use something like Consumer Reports to help them judge the worth of new drugs coming on the market. They borrowed $25,000 from a psychiatrist, and The Medical Letter was born. Our flagship publication, The Medical Letter on Drugs and Therapeutics, was first published in 1959, and is now available in 3 languages: English, French, and Italian. Our subscribers are located in almost 100 countries and include practicing physicians in every medical specialty, pharmacists, physician assistants, nurse practitioners, medical educators, residents and interns, and medical and pharmacy students.